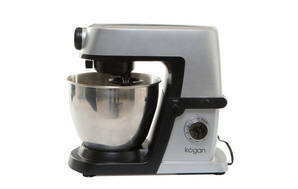 Snapshot: The Kogan 1200W Deluxe Stand Mixer has a 6L bowl and comes with a whisk but no scraper-beater. How well does it beat, mix and knead? Has a spring-loaded motor head. Poor results in our mixing (cake batter) test. Many cracks and crevices where food can accumulate. High pitched ringing sound during mixing.